We have already posted on most of these but it gives us hope to see them all on the same page. Now if more churches around America can get on the same page with the Holy Spirit maybe we will see this list expanded before the year is over. I would like to see it spread like popcorn popping. 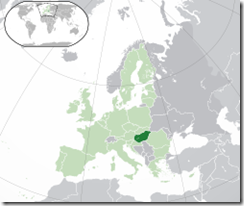 -Hungary: ‘Greatest Revival of Our Time’? Recently, I returned from speaking and teaching in Hungary with my son Robby, … Hungary was a wonderful, definitive, different experience because Hungary is in the midst of revival. More than 60 percent of the members of Parliament there are Christian. The prime minister, who was once a typical European leftist, who started out a Communist Youth leader, came to Christ and is on fire for God. 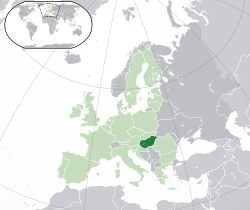 Members of the cabinet are pastors and leaders in Reformed and other Hungarian churches. Besides speaking at the conference that brought me to Hungary, World Congress of Families, I got the chance to speak in the largest Christian church, 60,000 people, one of the largest churches in the world. That church owns the biggest news network in Hungary, reaching 2 million people. What makes all of this so exceptional is the history of Hungary. Response: This is really good news. Most of the time when we read about Europe it is all about how Muslims are taking over significant parts of Germany, UK, Sweden, and causing trouble in France. We forget about what is happening in the former communist countries in the East where Christianity seems to be flourishing more than in the West which is seemingly becoming more secular. A remarkable move of God that began last May in Burlington, North Carolina, stirred many hearts through July. Pastor Randy Hobbs had only scheduled evangelist C.T. Townsend to spend a week in his church, but as the power of God fell, many were saved and the revival stretched on in a borrowed tent for weeks—filled to capacity every night. “The only reason the (revival) meeting shut down (in July) is because we couldn’t keep the tent any longer. The man needed the tent back,” recounts D.R. Harrison, one of those saved during the revival. 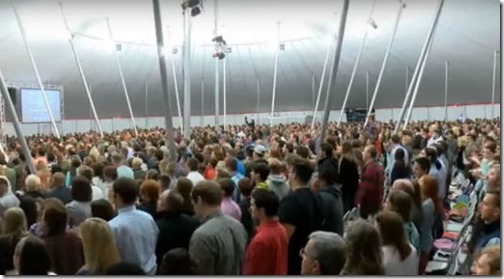 No one knew what would happen when Townsend and his team re-launched their crusade two weeks ago under a newly constructed tent holding 5,000 people. “It’s been incredible,” Harrison exclaims. 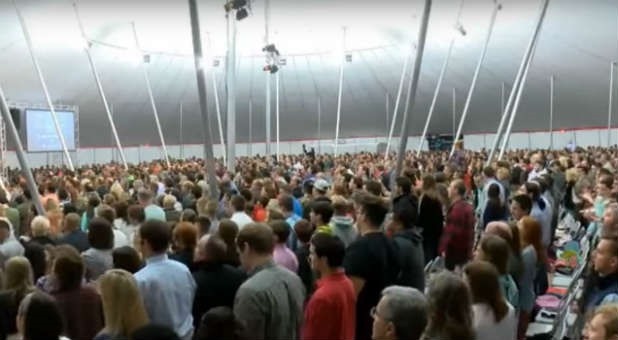 “This last Friday night was our biggest night with over 4,000 people, and there were 78 saved. During the first two weeks of the crusade, 130-140 made professions of faith, and crowds averaged about 2,000 a night. The momentum seems to be building, according to Harrison. Some of the services have been viewed over 100,000 times on the internet, and their livestream crashed May 12 due to traffic that overwhelmed server capacity. Response: I believe we are in a season when similar revivals can happen all around North America. The character of each might be considerably different in every place but one of the major themes is going to be the unity of the American church. This move of God across America is destined to go beyond denominations, affiliations, or any of the designations that we are familiar with including race. Look for Mainliners, Catholics, non-denominational evangelicals, Baptists, black and white and Latino churches and all colors to participate along with the Charismatics and Pentecostals that you would expect.